Bedford A hosted Bedford B as both teams kicked off the second half of their seasons with the A Team looking to re-boot their title challenge and B Team looking to pull away from trouble at the bottom of the table. Blink and you missed the Board 1 clash between Marc and Steve. Marc tried a Ledge-esque opening and initially looked OK, but unfortunately had one of those moments we have all experienced of missing a tactic, and managed to get his queen trapped on h5. James made is B Team debut against Richard on board 2. 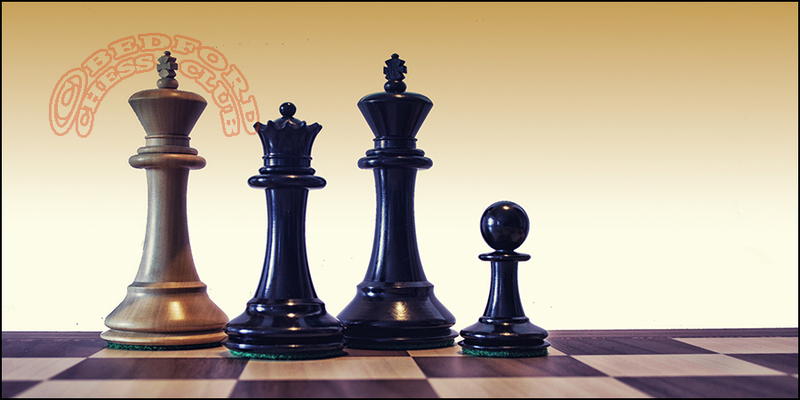 A Queen’s Gambit led to a an level position with James having more space, but an isolated queen’s pawn. Matters took a Karpov-Kasparov turn (think about all those exciting draws in their first match) and the game was halved in 18 moves. Qais faced Andy on Board 5 and initially the game was even, but after queens were exchanged Qais appeared to have a clear advantage with a better bishop v knight and more active rooks. Qais pushed his kingside pawns effective and firstly pushed a protected passed pawn to h6 then finished with bishop sacrifice which was going to lead to the pawn promoting. Board 4 saw Steve take on Ravi. A Queen’s Indian-style opening saw Ravi get the bishop pair and an awful lot of space. At one point it looked like Steve was going to get crushed in the centre, but he managed to hang grimly on to an ending, where Ravi stood clearly better. I have to confess I did not see the end, but Ravi converted his advantage to a full point. My game against Paul (see below)was a re-match from earlier in the season. I thought I was OK in the opening (another Queen’s Gambit), but played e5 too early – realising this was a mistake as I played the move. It gave Paul all sorts of chances to take on f7 and cause mayhem, but luckily for me he did not play it quite in the right order. Nevertheless Paul had a clear advantage, which he held into the endgame – a draw offer was refused, but I was not able to create any chances and a draw was agreed. A 3-2 victory for the A Team re-ignites their title campaign; for the B Team their next match against MK B and their April clash against Luton now look key to their survival chances.